Article 5-A. Average time to complete: Less than 8 minutes. 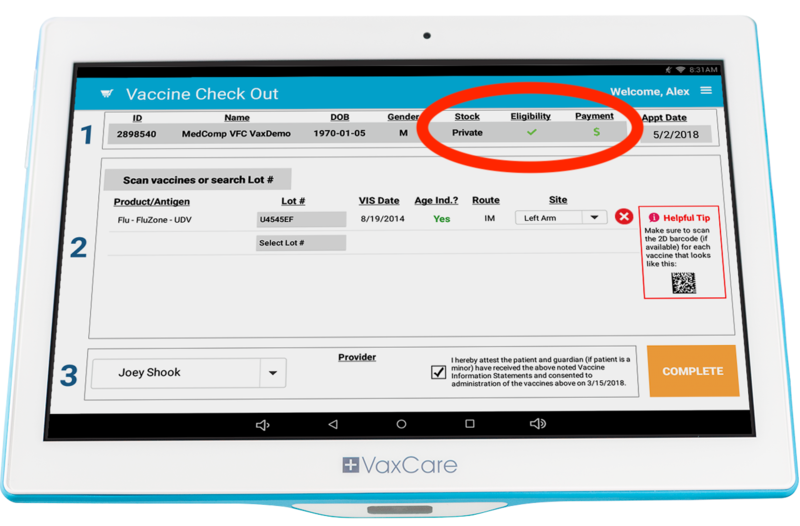 Vaccinating a patient - and VaxCare's Risk Free Guarantee - both start with checking your patients into our system. 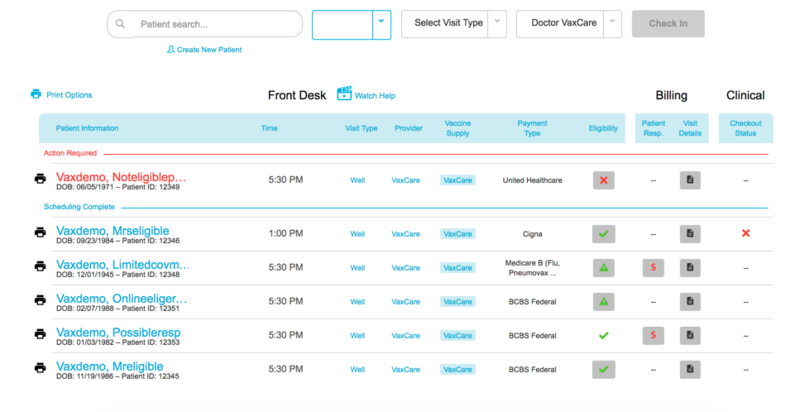 The integration between VaxCare and Cerner does the work of adding patients to the VaxCare Scheduler for you. Now we just need to check patient eligibility before vaccinating! Before a nurse vaccinates a patient they should check their eligibility in the VaxHub. A green eligibility icon means the nurse can proceed with giving the shot. Red eligibility icons indicate more financial information is required from the patient at the front desk. Front desk: Updating payment information and reading eligibility. All patients scheduled through Cerner will show up automatically under the date and location listed for their appointment. To begin, choose the correct date and location at the top of the Scheduler. Once you've selected the correct date and location, the list of patients for that date and location will appear on the screen. 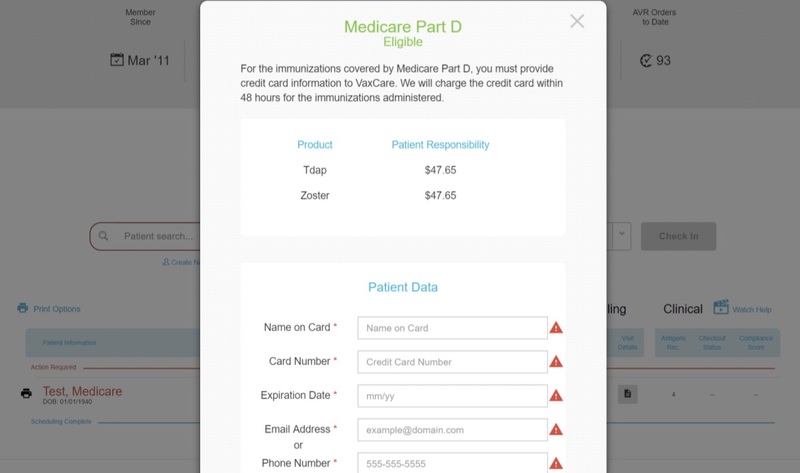 You can see that the VaxCare Scheduler automatically sorts patients into two categories: Action Required (red eligibility icons) and Scheduling Complete (green eligibility icons). 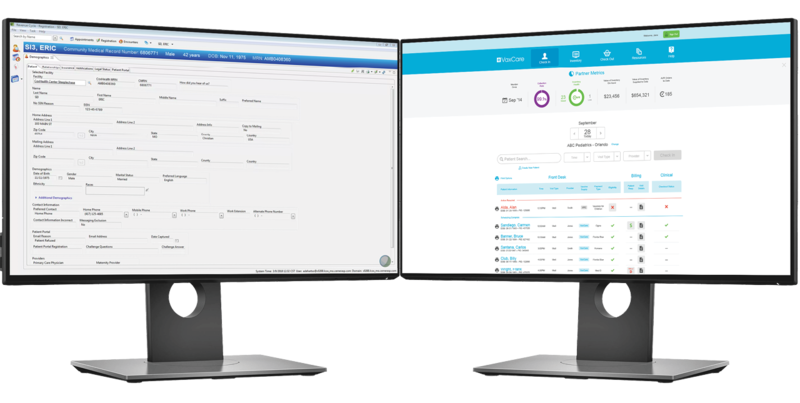 Just like the fictional Scheduler above, most of your patients will have a green icon, will move to the Scheduling Complete section automatically, and will require no further action. For example, both Mr. and Mrs. Eligible returned a green check. If you click on their Eligibility Icon, the system shows they are Risk Free, meaning they are ready to be vaccinated! If any patient in the Scheduling Complete section shows a red dollar sign, this means you can vaccinate the patient, but in order for the vaccines to be financially Risk Free for your practice, you must collect the information requested. For non-Medicare patients, the red dollar sign is an indication that your patient has a high deductible plan and vaccine coverage cannot be verified, so the pop-up will prompt you to enter a method of payment in case the patient has some financial responsibility. For Medicare D patients, the red dollar sign indicates that the patient has additional vaccines available to the patient through their Part D coverage. Let's take a quick look at the Medicare D process. If you have a patient who is 64 or older, VaxCare will present a Med D icon in the patient responsibility column. To run a successful Med D eligibility check, you must provide a valid social security number. The patient will almost always have a copay. This copay must be collected by entering a credit or debit card, which will be charged within 48 hours from administration of the patient's vaccine(s). 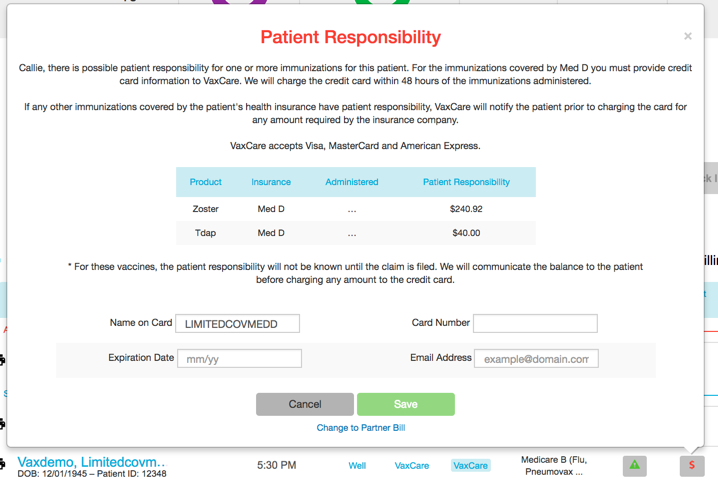 If an email is not provided, VaxCare will provide a receipt directly via mail. Enter in "1111111111111111" in the card number box. This fictitious card will notify VaxCare to bill the patient directly through mail. Once you enter this payment information, your Med D icon will have a green check mark, ensuring that your patient's check-in is Risk Free. If your patient is not eligible or the patient has already received TDAP or Zoster, the vaccines will not show up in the list of covered vaccines and you will see the red Med D icon. Once you have confirmed Med D eligibility and entered the patient's copay information, click on the printer icon to the left of the patient's name to print their consent form. Have the patient sign the consent form before vaccine administration. It is a CMS requirement to capture patient signature. CMS (Centers for Medicare and Medicaid Services) requires signature of the patient or the patient’s legal representative to validate a properly executed Medicare D informed consent. Therefore, VaxCare requires a copy of the signed patient consent for Med D.
Once you have administered the patient's vaccine(s), fax the signed consent form (or batch of consent forms) on a daily to weekly basis to 855-418-9149. VaxCare will reply with a confirmed receipt. VaxCare will not submit the Med D claim to Medicare until after the signed consent form has been faxed. If we do not receive the signed consent form after 25 days, VaxCare will charge back to you the cost of the Med D vaccine. In this case, our patient’s member ID is expired. We’ll simply update the patient’s insurance information in Cerner when they arrive. This new information will be sent to VaxCare.com as soon as you save the record. The insurance eligibility will rerun in VaxCare automatically, and the eligibility icon will turn from a red X to a green check. Our patient will move to the Scheduling Complete section, and they’ll be ready to go! Always check VaxCare eligibility before vaccinating in the VaxHub. Always click on the Eligibility icon in VaxCare.com if you are unsure what a response means or how you can correct the issue the system has identified. Always make changes to patient demographic or insurance information in Cerner. This information will be automatically sent to VaxCare. What should you do if the patient you are checking in shows a Red X (“Not Eligible”) under the Eligibility column?